Audio File: Over 100 minutes audio files are available for download (1800 + tax yen) from www.febe.jp. This book was featured on BBC WALES, WalesOnline and Y Drindod Dewi Sant Prifysgol Cymru / Trinity Saint David, University of Wales's news on 25 August 2011! 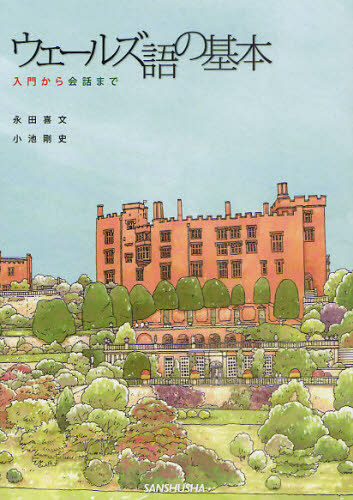 This is the FIRST EVER Welsh textbook in Japanese to learn basic colloquial Welsh. Ue-ruzu Go no Kihon or The Basics of the Welsh Language consists of twenty chapters, each with a lively dialogue, useful vocabulary and grammatical points. This book mainly introduces the basic sentence patterns called 'the periphrastic construction' with the verb bod (such as rydw i'n rydych chi'n, mae e'n, etc.) : by mastering these patterns learners will be able to talk about most of everyday conversation topics such as hobby, likes and dislikes, and of course, weather! The mutations, one of the biggest hurdles in learning Welsh, are introduced with abundant explanation and examples, and the exercises will drill the learner in mastering the mutation rules. A set of exercises is given in each chapter to master the basic patterns of Welsh sentences. A list of all the words and phrases contained in the textbook is given at the end, with a pronunciation key (in both IPA and Japanese Katakana), the meanings, and the number of chapter in which the word appears. This will prove very useful for Japanese users, considering that fact that there is not (yet!) a Welsh-Japanese dictionary published so far, and moreover, that there is NO dictionary of Welsh (whether Welsh-English or any other language) which gives a pronunciation guide for each word. A cultural column is given at the end of each chapter. It deals with food and drink, music, tourism, history, proverbs, literature, as well as the language itself, which are all important aspects of the Welsh culture. Over 100-munite audio files, available for download (1800 + tax yen) from www.febe.jp, include the Welsh alphabets, greetings, dialogues, numerals, and answers for all the exercises. Buy now on the amazon.co.jp!